An eight-man gang known as the Eight Dragons attempt to steal a treasure map from a government official, but when a simple robbery ends up in the massacre of the entire household, a rethink of their plan is required. Fearing the wrath of the district police, they agree to split the map into eight sections (it's octagonal, which is handy), keep one piece each and meet again in three years time to claim the treasure when the heat has died down. Three years pass and one of the gang, who has been arrested on a petty charge, escapes with the help to another prisoner and meets up with one of his former partners in crime. But his fellow escapee turns out to be undercover cop Fong-yi, who has been working for some time with his partner to retrieve all of the map pieces. 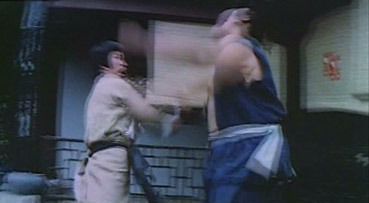 When the gang members kill his criminal companion (with a spade in the stomach – ouch), Fong-yi violently dispatches the pair and sets off to retrieve the remaining segments of the map. All of which sets things up for series of kung-fu battles in which Fong-yi goes up against a variety of opponents and weapons, paving the way for the plot to take something of a back seat. Which is exactly what it does, of course, but things do not always play out as expected. 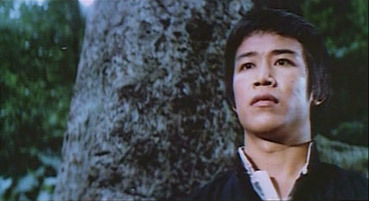 One gang member, for example, fights to keep his segment not out of greed, but to procure funds for his blind mother and unwell son, and after beating him to bits, Fong-yi has to visit the mother to tell her comforting stories and make financial restitution for his actions (in a sequence that is awash with the sort of jaw-dropping sentimentality that Hong Kong cinema sometimes specialises in). Others that you would expect to fight to the death end up begging for mercy and are allowed to flee with their lives, and at one point Fong-yi is captured by the remaining gang members and secured to a post, though given his preference for spectacular kicks, you'd think someone would have tied his bloody legs up. The fights themselves are bit of a mixed bag. Fong-yi is played by Tan Tao-liang, whose fancy legwork was responsible for his nickname of 'Flash Legs' and the re-titling of this film to the same from the far better Shaolin Deadly Kicks. Liang's moves are certainly impressive in themselves, but too many of the fight sequences are done in a style I have started calling 'Rehearsal Kung-Fu', in which the opponents run through a series of choreographed moves as if they are warming up for the actual take, with no sense of any real force being used or contact being made. Every now and again, though, we get a taste of the real deal, usually in the shape of swiftly delivered roundhouse kicks to the head. Some fights are a lot better than others, standout battles taking place at a roadside and against swordstick-wielding gang member Chu, and it's always good to see a female fighter proving she can kick as hard as the boys. Even allowing for the leaps of credibility inherent to the kung-fu genre, there's some serious swallowing to do here. When Fong-yi is ambushed with bamboo spears, for example, he convinces his assailants he has been killed by faking a spectacular fatal injury, which suggests that he arrived prepared for just this eventuality and had the sawn-off spears and fake blood hidden behind a nearby rock. Real spears probably wouldn't have killed him anyway – he collects an astonishing assortment of vicious wounds on his quest, from sword cuts to a poisoned knife in the back and being gouged with a metal claw, but recovers from each in no time at all with little more than a bandage and a change of clothes. The Flash Legs is a middling piece of old-school kung-fu that occasionally rises to something better. Of definite interest to genre fans, not least for the kicking skills of Liang, but it's not one that most of us will be falling over each other to get our hands on. Three letters come to mind when watching 55th Chamber's recent DVD release of The Flash Legs: V, H and S. The non-anamorphic 16:9 picture is riddled with issues and looks and sounds as though it has been hauled off of a low band tape copy, and an NTSC one at that. Contrast in particular is variable and shadow detail is always weak, with black levels up and down depending on the shot but are never close to ideal. Dust spots are frequent and sometimes numerous, on occasion accompanied by print damage. Most edits are signified by a frame-long white line at the top or bottom of the screen (sometimes both at once) and there is an almost constant shimmer to the picture that is particularly evident on areas of one colour (except black, of course). The main title has clearly been added once the print had been hauled onto the computer for mastering, and the film does not so much end as come to a halt, a freeze frame followed a couple of seconds later by the music cutting off in mid-stream and the frame and visible film damage leaping briefly in the gate. Ignoring the fact that only the original English dub is available (and rough though it is, it's not as bad as some), the suspicion of low band tape master is enhanced by auto record levels that whack the background hiss and hum right up if there is even a second of silence, only to drop it sharply when someone speaks. Loud sounds are noticeably distorted. The 55th Chamber usual bare minimum here consists of The Flash Legs UK Promotional Trailer (1:28), which looks as if it's been knocked up in an hour on a home computer, an Image Gallery (0:58), which is actually quite good if a little brief, and a promo for some of the label's current releases. Once again 55th Chamber have rescued a lost genre work from obscurity but at a serious cost in terms of picture and sound quality. Of course you can argue that at the very reasonable retail price of under £6 you can't expect Hong Kong Legends quality, but this is still way below par for DVD. If by some chance you have it on tape then I'd stick with it – this is unlikely to be an improvement.